All items are built for this lock. Hardened steel shackle. 4mm shackle diameter. Please note this lock should fit sideways on your Mature Metal device. You will receive a shipping invoice if only a lock is ordered. 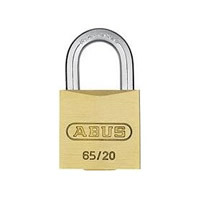 These Abus brand locks come in 2 varieties, keyed alike (KA) and keyed differently (KD). The KA Uses the same blank as the common Master brand of the same size and you can get a copy made at any locksmith or order it by key number. The KD version uses a different blank that is not imported into the US as far as I can tell. None of the locksmiths in my area can copy it. It comes with 2 keys and that's all there is. Abus locks are also more corrosion than most brands. That's important if you lock up for a year or longer. After a 3 year lockup, my Master brand lock didn't open. Now I use an Abus.